Daylight Saving Time ends tonight at 2 a.m. Don’t forget to set your clocks 1 h back! 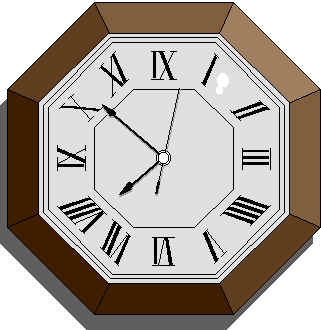 Don’t forget to set your clocks back one hour before going to bed tonight because Daylight Saving Time ends Sunday at 2 a.m.
Benjamin Franklin was only kidding when he suggested 227 years ago that towns should employ church bells or cannon blasts to wake citizens at sunrise so they could take full advantage of sunlight. More than two centuries later, daylight saving time is no longer just an amusing idea. Twice a year, we’re forced to adjust our sleep habits, synchronizing our biological and digital clocks to squeeze more sunlight into our waking hours. Meanwhile, sleep researchers insist we should be cutting back on our waking hours if we really want to live long and prosper. So here we are, caught somewhere between popping sleep aids and chugging Red Bull, not sure how to feel about our collective changing of the clocks. Don't forget to set your clocks back one hour before going to bed tonight because Daylight Saving Time ends Sunday at 2 a.m.
David Prerau has devoted much of his life to chronicling the history and science of DST. He served as a consultant to Congress in 2005 when it extended daylight saving time to save, and he also consulted on DST to the United Kingdom Parliament. David Prerau holds a PhD from M.I.T. Although Benjamin Franklin certainly gets a historical nod for his amusing commentary about our waste of perfectly good sunlight, Prerau points to British early riser and golf fanatic William Willett as the godfather of daylight-saving time. “He used to go for early morning horseback rides and wondered why nobody else was up enjoying this beautiful time of day,” David Prerau said. William Willett detailed his time-wise idea in a pamphlet, “The Waste of Daylight,” and spent years lobbying Parliament in vain to adopt daylight-saving time – he died in 1915 before that would happen, David Prerau said. Germany was right on time, however. Seeing merit in William Willett’s bright idea, Germans adopted it in 1916 to conserve energy and resources during World War I. That launched a daylight-saving domino effect in Europe. Britain was finally shamed into adopting the policy three weeks after Germany. Not to be left in the dark by our European counterparts, the U.S. officially adopted daylight-saving time during WW I, and again during World War II. By the end of WW I, city dwellers learned to love daylight saving, David Prerau said. But country folk, still in tune with nature’s clock, became disgruntled once they realized they’d actually have to rise before the sun if they were to get their goods on outbound trains that, under daylight saving, left town an hour earlier. “Rural people bombarded Congress with requests to repeal daylight saving time,” David Prerau said. John H. Bartlett didn’t know Woodrow Wilson was a big fan of daylight saving. When Congress voted to repeal daylight-saving legislation, Woodrow Wilson vetoed it. And when Congress voted a second time to repeal it, Woodrow Wilson vetoed again. “It was an interesting time in history,” David Prerau said. In his 2005 book, “Seize the Daylight,” David Prerau includes all kinds of historical anecdotes about the chaos that ensued over the random nature of daylight saving until federal legislation finally standardized it in 1966. One of his favorites is the one about the bus ride that spanned 35 miles and seven time zones between Ohio and West Virginia. “It became nationally famous as a sort of curiosity. People rode the bus just to change their watches seven times,” he said. David Prerau believes the upside of daylight-saving time isn’t economic; it’s the lifestyle benefit. People have more time to mingle and recreate. “People don’t like driving in the dark, and daylight savings reduces traffic accidents. Crime is reduced also, because of that extra hour of daylight,” he said. The Energy Policy Act of 2005 went into effect as of 2007, extending Daylight Savings in the U.S. by three to four weeks in the spring and one week in the fall. Since then, more studies are in the works to see if increased use of air conditioning may actually negate whatever savings were originally calculated, David Prerau said. “There’s going to be more studies, and if they end up being negative, Congress may want to reconsider,” he said. “But I doubt it. There’s the other problem, of having to reprogram computers and clocks. It was a big deal for companies last March. And having gone through that once, people may be reluctant to change back,” David Prerau said.